Looking for a gorgeous collectible that’s still affordable and stunning when displayed? Antique transferware is just the ticket for collectors who love to mix antiques and décor. In fact, antique transferware collections can often be found displayed in homes featured in interior design magazines. It’s the variety, colors and looks that make transferware “oh-so popular” for casual and serious collectors alike. Antique transferware is a group made up of dishes that were decorated by the process of transfer of the decoration rather than being hand painted. These dishes became popular in 18th Century England as a new middle class began to emerge from the ranks of Englishmen. With this middle class came the need for dishes that were less expensive than the hand painted masterpieces that were made for the aristocracy. Transferware enabled dishes to be decorated in an early form of mass production. The pattern of the dish is etched into a copper plate, which is then transferred to a paper, and from the paper the decoration is transferred onto the piece itself. The transfer process is normally found on pottery or earthenware, but ironstone, china and porcelain were also used in the transfer decorating process. Decorated in the manner of the early, hand painted Chinese porcelain dishes, blue and white transferware has remained popular over two centuries later. 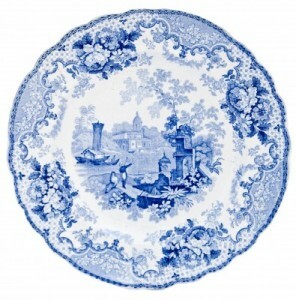 Late 18th Century and early 19th Century English plates, particularly those depicting European views and scenes of everyday life are extremely popular and affordable for transferware collections. Blue and white transferware dishes can still be found for under $50, while larger serving pieces can run as much as $1,000 for finer or rare pieces. While blue and white transferware remains popular, other colors of English transfer dishes are favorites for collectors. Dishes decorated in transfer colors of black, deep brown and red are also popular for collections. The colors are normally termed mulberry, sepia and pink in transferware, and like their blue and white counterparts, affordable examples can still be found. They tend to be a little more expensive than blue and white dishes, but can still be found for under $60, and the rare examples can run in to the thousands of dollars. The patterns and colors of antique transferware are too numerous to detail, but suffice it to say, there’s a piece of transferware to suit any taste or décor. If you plan on building a collection of antique transferware, try to focus on a particular color, pattern or maker and buy pieces with strong, crisp details with no condition issues. Loch Lea Antiques in Paris, KY is a great place to find quality antiques like transferware in central Kentucky.